When top dressing lawns, there are several important steps that can be done to ensure good results. They are listed in the order they should be performed, though not all of these steps need to be done on all grasses. If your lawn has more than ½ inch of thatch, dethatch your lawn first. Remove all grass clippings and dethatching debris. Core aerate the lawn. If you have poor soil, consider removing the cores. 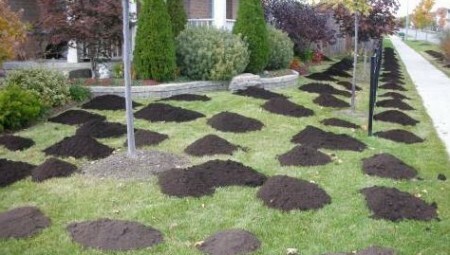 If the soil is not too bad, you can just leave them on the grass to break down naturally. Lightly rake the compost with the backside of a rake. 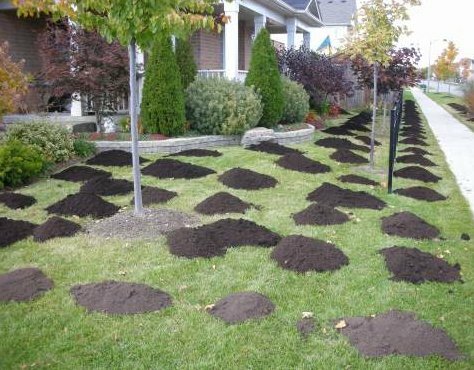 The goal is to get as much compost touching the soil as possible. If you plan on overseeding, do this after the topdressing is down. With enough moisture, much of the top dressing should work into the soil within a week or two.